A little bit of bottled salmon goes a long way. It is best to use smaller bottles if possible. Add salt, sugar and vinegar to each jar before putting on the seals and rings. Following congratulations from your fishing mates on having finally landed a salmon, the question often asked is, “What do I do with so much fish?” A single 20 pounder will produce heaps of fillets – far more than two people can hope to eat in a day or two. Salmon fresh from the sea is also very rich in protein, a little goes a long way! For many anglers, the answer has long been to bottle the catch. In earlier years this was the only reliable way to preserve summer caught salmon for use over the winter months. A pile of salmon cut up ready to fit into jars. Any bones will become soft and eatable with the long cooking time. The bottling process really starts the moment you land your fish. The name of the game is to gut and gill your salmon and get it into ice as quickly as possible. More about looking after your catch. There are many differing opinions as to how to go about bottling salmon, but I have found the following to work well. If you like you can freeze your fish when you get home and bottle it later. If you are anything like me, you’ll be exhausted after a day on the water, and when you finally arrive home after a long drive you don’t want to start bottling in the middle of the night! I usually thaw out and bottle the catch a few days later when I find the time. There is no reason you can’t leave the salmon in the freezer for a couple of months before bottling it if you wanted to. Mullet scaled, filleted, and packed into jars. At the camping grounds, near the big east coast salmon rivers, it is not uncommon for anglers to bottle their fish as soon as they catch it, preferring to stop fishing after catching one fish because of the time needed to process it! When staying in a caravan this also solves the problem of finding freezer space. 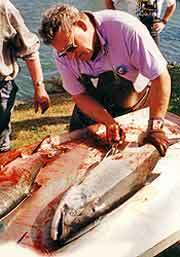 A big salmon like this one can produce several dozen jars. It takes about a dozen 500g jars to bottle a 24 lb salmon. Just how much fish you end up with depends on whether you bottle clean fillets, or leave the skin and bones still on. I prefer the latter option. Start by washing your jars and then placing them in a big pot of cold water and bring to the boil. Boil for at least fifteen minutes to kill any germs. Then dry and place in a hot oven. Place the rings and seals in a smaller pot and boil them for a similar time. While these are boiling away you can cut up your fish. The idea is to cut it into shapes so that it will pack down tightly into each jar with about 20mm left at the top. This can be a bit fiddly depending on how fussy you are. Do the whole process in one batch if you can. When you have all the fish in the jars add: a teaspoon of salt, a tablespoon of vinegar, and a teaspoon of sugar into each jar. You can also add a teaspoon of olive oil if you wish, but most people omit this. Screwing down the rings. Don’t forget to wipe around the rim of each jar with a clean cloth so you get a good seal. Carefully wipe the rim of each jar with a clean cloth to remove any bits of fish and place a seal on the jar and screw the ring on tight. Place the jars in a big pot. Ensure they are not touching so they don’t bang together and break. Obviously, you need a big pot. It is also better to have several pots so you can do the whole job in one go. Cover with cold water to at least an inch over each jar and bring to the boil. How long you should boil your jars of fish depend a bit on who you talk to. Some people boil theirs for up to six hours, but three hours is the minimum time needed. Don’t start counting your time until the water is boiling furiously. Bottled yellow-eyed mullet and kahawai together. The bones become very soft just like canned fish bought at the supermarket! Finally, don’t forget to label each bottle with the contents and date. 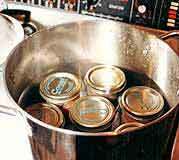 At the end of this boiling time carefully take each jar from the pot and place on top of a towel on the table. The jars will be very hot so use tongs and a towel when handling them. Give each ring an extra tighten for good measure. After a half, an hour or so as the jars cool the seal will pop down. This indicates that they have sealed properly. Any that have not popped down should be kept in the fridge and used straight away. 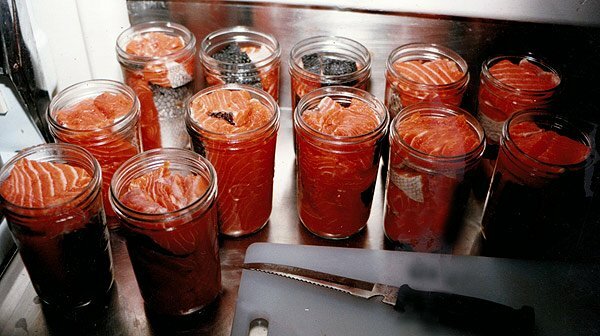 A friend who has had many years experience bottling salmon advises that you can remove the seals from any jars that have not taken, place on new seals, and rings, and then boil again for at least another hour. A little bit of bottled salmon goes a long way. It is best to use smaller bottles if possible. Bottling and canning are essentially the same. Finally, when cooled remove the rings and place in a dark cupboard. Salmon preserved this way will keep for at least several years. People have reported that it lasts for up to ten years done this way. We always end up eating all of ours before the next salmon season comes around. Don’t forget to label each bottle with the date. You can also include the size of the fish and the river you caught it from.